Agriculture Minister Prathipati Pulla Rao launched ‘Internet Saathi,’ a joint venture of the Tata Trust and Google India, aimed at extending Internet services to rural areas, here on Saturday. The programme was launched as a pilot project in Andhra Pradesh. Mr. Pulla Rao said ‘Internet Saathi’ would be useful in successful rollout of the State’s ambitious fibre grid project. 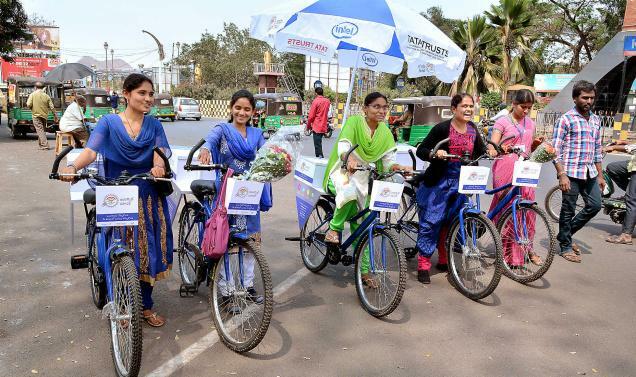 Volunteers would go around 265 villages in the Vijayawada parliamentary constituency on bicycles and explain the basics of computers and Internet connectivity. “The Tata Trust adopted the villages in the Vijayawada Lok Sabha constituency as a pilot project in Andhra Pradesh and the villages would be developed into Smart Villages,” the Minister said. The government was set to offer Internet connection to every household with 15 Mbps for nominal charges. The scheme would be particularly helpful to students in improving their knowledge as a treasure of educational resources would be available at the click of a mouse. “Internet Saathi would enable one to know about job opportunities posted in various social media sites, agriculture and weather updates and welfare schemes being implemented for women, children, girls and the poor,” Mr. Pulla Rao explained. Vijayawada MP Kesineni Srinivas said training has been given for select candidates to spread awareness on ‘Internet Saathis.’ The trained candidates were provided two smart phones, two tablets and mobile net service kits each for giving demonstrations in to villages. “The trained Internet Saathis would tour in villages in the Nandigama and Jaggaiahpet Assembly constituencies in the first phase and in the Mylavaram and Tiruvur segments in the next phase and enlighten people on the benefits on the use of the Internet,” Mr. Srinivas said. District Collector Babu.A. thanked the Tata Trust management for launching the programme in Krishna district. He appealed to the Internet Saathis and the villagers to make the pilot project a success for extending the programme to other villages and districts. “There are about 120 welfare schemes being implemented by the government. I request the Internet Saathis to focus on training DWCRA women on use of the Internet for the success of government schemes,” Mr. Babu said.